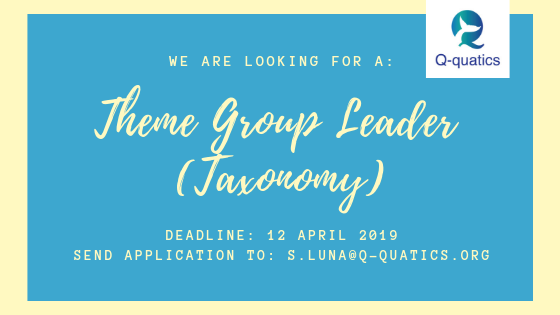 Job Opening: Theme Group Leader (Taxonomy) – Quantitative Aquatics, Inc.
Quantitative Aquatics, Inc. is a non-stock, non-profit, non-governmental organization established in the Philippines in February 2017. Q-quatics was created to support the assembly and dissemination of key data on living aquatic resources for the development of research tools in collaboration with international partners. As such, Q-quatics manages the global biodiversity information systems FishBase, SeaLifeBase, and the global aquatic biogeography initiative, AquaMaps. Q-quatics also supports the cutting-edge databases and research developed by the Sea Around Us (www.seaaroundus.org), which provides policy options for marine fisheries resources, their sustainable use and possible responses to climate change. As such, it partners with the Sea Around Us in identifying projects that would help initiate or maintain research on global fisheries and biodiversity conservation. Q-quatics is governed by an international group of scientific institutions referred to as the FishBase Consortium (FBC). Manage general to do list of the taxonomy group. Perform all other related duties that may be assigned by the SD, TC or ED. MSc in Marine Biology or Biology (preferably major in Zoology, Ecology, Wildlife or Systematics). A Ph.D. in taxonomy, systematics or taxonomy-related sciences is preferred. Expert knowledge of aquatic biodiversity and taxonomy and a minimum of 8 years working with taxonomy-related tasks if without a Ph.D., preferably in a database platform (for example, as used by the Catalogue of Life or by the World Register of Marine Species). We are looking for candidates with excellent organizational skills and attention to detail and good communication skills both in written and verbal English. This leadership position requires strong interpersonal skills and ability to work in a team. We are looking for candidates who can work independently, have good time management skills and with a high degree of initiative and resourcefulness. Proficient knowledge of computer software, e.g., MS Office applications, particularly MS Access or MySQL, is desirable. For immediate action, please send your application cover letter, comprehensive resumé with name and contact details of 3 referees, and transcript of records not later than 12 April 2019 via email with subject TLG-Taxonomy Qq addressed to s.luna@q-quatics.org or via snail mail to Susan M. Luna, G.S. Khush Hall, IRRI Compound, Los Baños, Laguna 4031, +63.49.536.2701 local 2864. Internal applications are preferred. Only candidates who have met the required experience and qualifications for this position will be contacted. We will keep your personal information in our database for future opportunities unless you direct us otherwise. Q-quatics is an equal opportunity employer. We value respect, integrity, and honesty in a diversified workplace.